Produced by our non-profit partners Livingbattlefield, The American Road to Victory is the most-watched World War II series in the history of public television with over 3,000 airings nationwide. Filmed in the exact locations where the actions took place and with incredible veteran testimonials and interactive presentations, the series consists of three films: The Americans on D-Day, The Americans on Hell’s Highway, and The Americans in the Bulge. From the beaches of Normandy, over the canals in the Netherlands, and through the frozen Ardennes forests in Belgium, battlefield historian Ellwood von Seibold brings military history alive in a way that kids can appreciate. 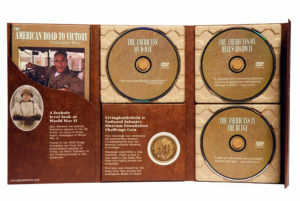 In 2010, Livingbattlefield partnered with the National Infantry Museum Foundation to create a special collector’s edition set, complete with campaign maps and a limited edition challenge coin.